The impact of the latest round of U.N. sanctions leveled against North Korea could be greater than the projected $1 billion cut in its export revenue if fully implemented, a high-profile North Korean defector told VOA’s Korean Service, and this would deal a significant financial blow to a regime intent on advancing its nuclear and missile programs. 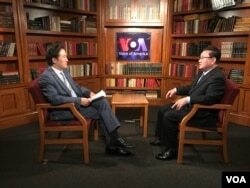 FILE - A senior North Korean defector Ri Jong Ho, who worked for the North Korean government for about 30 years, speaks with VOA Korean Service’s Baik Sungwon. In response to North Korea’s two tests of intercontinental ballistic missiles in July, the U.N. Security Council unanimously passed another round of sanctions earlier this month — the seventh since the regime’s first nuclear weapons test in 2006. Many experts in Washington welcomed the measure, calling it the biggest diplomatic victory of the Trump administration, which has been seeking to build international pressure on North Korea. 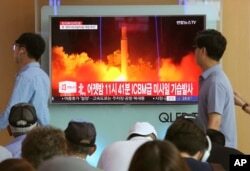 FILE - In this July 29, 2017 photo, People watch a TV news program showing an image of a North Korea's test launch of an intercontinental ballistic missile (ICBM), at the Seoul Railway Station in Seoul, South Korea. The sanctions call for, among other things, a total ban on the North’s principal exports, including coal, iron, iron ore, lead, lead ore and seafood. The goal is to slash a third of the regime’s annual revenue, which total about $3 billion by U.N. estimates in the August 5 resolution drafted by the United States. Ri said North Korea’s annual export earnings are in fact significantly lower averaging about $2 billion in recent years. Pyongyang’s garment production, which on the record brings up to $1 billion, actually yields $100 million at best, he said, covering only labor and costs incurred in maintaining production facilities and equipment. Garment processing not included in the U.N. sanctions has been one of the country’s biggest exports, with many firms, particularly based in China, taking advantage of low-cost labor available in the North to produce various kinds of clothing. Suppliers often send fabrics and other raw materials to North Korean factories where garments are assembled and exported with a “Made in China” label. From 2014 until 2016, Pyongyang exported some 15 to 22 million tons of coal and 2.5 million tons of iron ore per year, worth roughly $1.1 billion and $200 million respectively, Ri said, adding lead and lead ore exports in the same period averaged about $100 million and seafood sales $300 million a year. 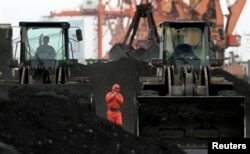 FILE - An employee walks between front-end loaders, which are used to move coal imported from North Korea at Dandong port in the Chinese border city of Dandong, Liaoning province Dec. 7, 2010. The effects of sanctions aren’t limited to these key exports, Ri said. Prohibiting North Korea’s exports of natural resources would cut off its supply of foreign currency, with an anticipated resulting drop in imports of strategic goods including fuel, food and fertilizers as well as various other raw materials and equipment necessary to keep production and construction activities going, said Ri. “In that case,” he added, “the North Korean regime will inevitably experience financial strains, which would put a damper on its pursuits” such as building a nuclear-tipped missile that can strike the U.S mainland. The new sanctions omit crude-oil supplies from Russia and China, which Ri said would be a crippling measure for the regime, one that Pyongyang’s traditional allies would not want to take. But because the current sanctions are expected to further diminish North Korea’s limited holdings of hard currency, the regime would be unable to purchase as much oil as it did before. In an earlier interview with VOA, Ri said North Korea imports up to 200,000 to 300,000 tons of diesel from Russia and some 50,000 to 100,000 tons of gasoline from China every year. China also supplies the North with roughly 500,000 tons of crude oil by pipeline, all of which though goes toward Kim’s massive military, all of which is free of charge. Ri added the sanctions could also result in an increase of the already rampant smuggling activities across China's border and a fierce competition for survival within North Korea. For three decades, Ri worked in "Office 39," which the U.S. Treasury Department once described as a North Korean government branch that engages “in illicit economic activities and managing slush funds and generating revenues for the leadership.” His last posting was in Dalian, China, as the head of the Korea Daehung Trading Corporation. Ri defected to South Korea in October 2014, and came to the United States in March 2016. Jenny Lee contributed to this report which originated with VOA's Korean service (www.voakorea.com ).